JAPANESE-AMERICAN CHILDREN who grew up in Northwest Portland’s Japantown in the 1930s remember it as a safe, happy place where they ran freely along the sidewalks and riverfront, played at the Skidmore Fountain and skated over the Burnside Bridge. “We used to go fishing along the river, catch suckers and put them in the fountain,” remembered Yoji Matsushima, whose family operated the Teikoku Company in the old Merchant Hotel on Northwest Third Avenue and Davis Street. “Everything evolved around the neighborhood,” Matsushima said. George Nakata’s family leased and operated the Pomona Hotel on Northwest Second Avenue, between Couch and Burnside streets. Matsumoto’s parents operated the Kamm Hotel at Southwest First Avenue and Pine Street, which was just outside Japantown. Many of the hotels in and around Japantown were run by Japanese immigrants who leased the buildings, because they weren’t able to buy property as noncitizens. Matsumoto’s father came to Portland at the age of 18 to avoid being drafted by the Imperial Japanese Army. Matsushima’s father worked in American hop fields and served as a water boy for railroad workers. Nakata’s father immigrated to escape the high taxes and famine gripping rural Japan during the Meiji Restoration Period. “Here was this rice farmer from Okayama, Japan, coming over, not speaking the language, who ended up operating a hotel and owning two fruit and vegetable stands,” Nakata said. His father returned to Japan to marry his mother and bring her back to Portland, which was common at that time. As more of the young men made the round-trip to Japan to marry their wives, or agreed to marry “picture brides” selected by their families, the businesses in Northwest Portland’s Japantown began to change. The young Japanese laborers who arrived in the West to work for the railroads, canneries and lumber yards eventually found themselves better-suited for running boarding houses, bath houses and Japanese markets. With the arrival of wives came a new beauty shop, a candy store and a school for Japanese-American students. The number of businesses grew to more than 100, making Northwest Portland’s Japantown larger than any other Japantown in the state, including communities in Southwest Portland, Milwaukie, Hood River and Salem. Japanese immigrants began settling all around the West, from Canada to South America. 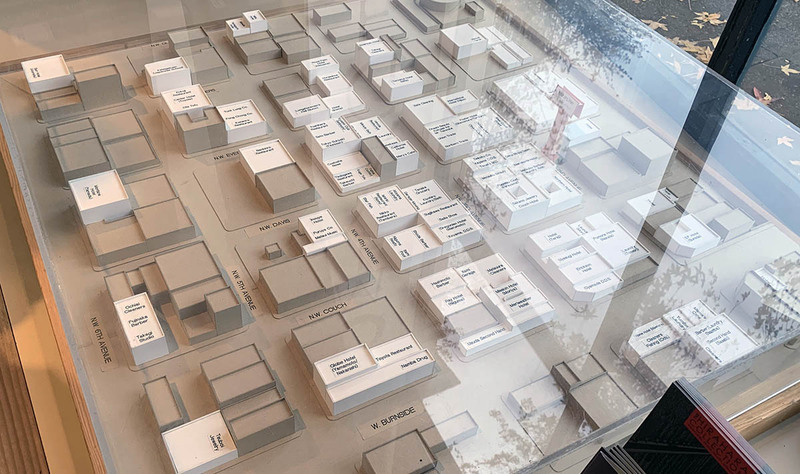 A model of Portland’s Nihonmachi, or Japantown – which stretched from the Willamette River to Northwest Sixth Avenue and from Northwest Ankeny to Glisan – is on display at the Nikkei Legacy Center. Before Northwest Portland’s Japantown came to be, an influx of Chinese immigrants had settled in the area. In 1882, with growing resentment against Chinese laborers, the U.S. government imposed the Chinese Exclusion Act. It was the first federal legislation to explicitly suspend immigration for a specific nationality. Historians say many Americans felt the Chinese were taking their jobs and, perhaps, performing those jobs more economically. Nakata, who periodically talks on the history of Japantown, said the resulting labor gap was largely filled by Japanese immigrants who also faced racial discrimination. Nakata said the first Japanese immigrant to arrive in Oregon was Miyo Iwakoshi, who settled in Gresham in 1880 with her Scottish husband and daughter. In the next 60 years, Northwest Portland’s Japantown became a community in and of itself. Japanese-operated businesses played a central role in the lives of the Issei (first generation Japanese immigrants) and their children (Nisei). Matsushima’s family mercantile, Teikoku, was one of several shops which supplied the families with everything they might need to thrive, including logging shoes, dry goods, radios, steamer tickets back to Japan and bank services to send money home. “By 1940, we had five delivery trucks, with customers in Astoria, Warrenton, the Dalles and Hood River,” said Matsushima. His family came to know the Merchant Hotel as home. Matsushima’s parents sent his older brother and sister to live with their grandparents in Japan, but he and his much younger brother stayed in Japantown. It wouldn’t be the last time their family would be separated. As a young boy, Matsushima attended Couch Elementary School, which was a mix of students, including many Japanese- and Chinese-Americans. Matsumoto and Nakata attended a private Catholic school for Japanese-American students called St. Paul Miki. The Sisters of the Holy Names opened the school and daycare in Japantown in the late 1930s to assist Japanese families who were busy running hotels and other businesses. The nuns taught the children English, writing, arithmetic and Catholicism, even though most of them attended the Buddhist Temple or the Methodist Church in Japantown. 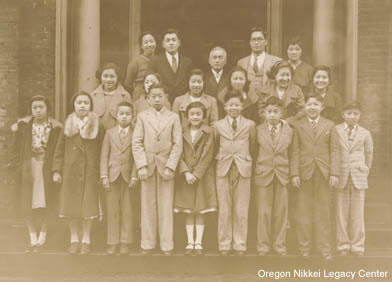 The Nisei in Northwest Portland also attended Katei, a Japanese language school on Northwest Fifth Avenue and Flanders Street. Schoolchildren at the North Japanese School (Katei Gakuen) in 1934-35. Nakata said from 4 to 6 p.m. every weekday and from 9 a.m. to noon on Saturdays, the students would study two Japanese alphabets while other American children were out playing games or going to the movies. “Children being children, we didn’t like that at all,” said Nakata. The children experienced an overall happy existence in Japantown, where they were shielded from much of the growing anti-Japanese sentiment along the West Coast. Matsumoto said the nuns must have taught her that line. Nakata recalled his father sharing a story with him about being ignored in a downtown Portland shop. Nakata’s father talked to him about the already strained relationship between Japan and the United States. For Japanese immigrants, the racial prejudice in America began well before World War II. According to Smithsonian.com, the Navy and FBI already had created a “watchlist” of Japanese immigrants who they feared might be inclined to sabotage or spy for Japan. The list of 1,370 Japanese men included 78 from Oregon, many from Northwest Portland’s Japantown, including Matsushima’s father. Nine-year-old Matsushima first heard about the attack in Pearl Harbor when he awoke to hear the paperboy yelling the headline outside his window. Four days later, his father was arrested, taken to jail and transferred to a U.S. Department of Justice lock-up without explanation. “When the war began, in the next several days, the FBI came swooping in and arrested all these people on their list,” said Nakata, whose father was not taken. Many in Japantown believed Pearl Harbor provided an excuse for the government to finally cave in to the intolerance and remove Asian immigrants from local communities. “They told us we had to sell everything in the store,” he said. A few blocks away at the Kamm Hotel, 7-year-old Matsumoto remembered her family destroying all their Japanese records, books – anything that might imply allegiance to Japan. The U.S. government had proclaimed the Issei “enemy aliens” and froze their bank assets. A newly-imposed curfew required people of Japanese descent to remain in their homes from 8 p.m. to 6 a.m., which prevented Nakata’s father from operating his early-morning fruit stands on Northeast Columbia Boulevard. Rumors circulated in the neighborhood about camps being constructed to imprison Japanese families. President Franklin D. Roosevelt confirmed those rumors when he signed Executive Order 9066 on Feb. 19, 1942. Military orders went out to parts of Oregon, California, Washington, Arizona and Hawaii to round up all Japanese immigrants (Issei) and their children (Nisei), even though the children were U.S. citizens. Families in Northwest Portland’s Japantown received notices telling them to report to the Portland Assembly Center. Nakata said the government claimed sending the families to the camps was for their own protection, but wondered why the rifles were always pointed at them. “We were told you’re going to be evacuated,” said Nakata. “Get rid of household things, and you can only bring what you can physically carry.” He said his sister had to leave her beloved set of Japanese dolls, while he had to abandon his books and balls. His mother destroyed her beautiful silk kimono. “We gave up everything of comfort to our family,” Nakata said. Matsushima, his mother and his 1-year-old brother were granted an extra week to report to the assembly center, since his little brother was sick. Days later, one of their former store employees hired a driver to take them to the stockyards, where they walked through the guarded barbed-wire fence to be assigned a stall. 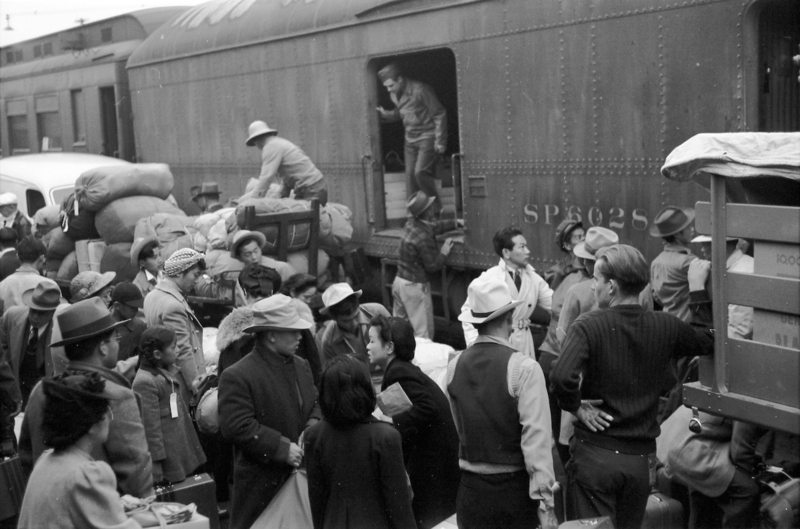 Japanese-Americans are loaded onto trains in 1942 in Portland. Life at Portland’s Assembly Center was difficult for the nearly 4,000 prisoners. The wood floors covered former animal pens, which reeked of manure. Matsushima said insect strips hung everywhere to deal with a fly infestation, which was exacerbated when the floors were watered down to cool the center. The Matsumoto family arrived at the so-called “Barbed Wire Barn” with just a few suitcases and a couple pieces of furniture. The Issei were assigned family numbers to mark their cubicles, clothing and belongings. Matsumoto has never forgotten her family number, #15137. It is still scrawled on the bottom of the chairs her father brought to their cramped living quarters. Matsumoto and her family tried to adapt to the lack of running water and the constant sounds of their neighbors snoring and tending to crying babies. Nakata said the Japanese relied on their resourcefulness. In the four months they were imprisoned at the Portland Assembly Center, the immigrants set up a make-shift school, a doctor’s office, mail service, church sessions, recreational activities and a newspaper. The young children adapted quickly to the camp’s activities, games and newfound freedom, but the Issei struggled with the constant boredom and loss of control. All of their efforts to make the center more “livable” for their children couldn’t prepare them for what came next: three years in the Idaho desert. In September of 1942, most families at the Portland Assembly Center were bused to Union Station for the long train trip to the Minidoka War Relocation Center. The camp was located in what Nakata described as a “sea of sagebrush” nearly 20 miles northeast of Twin Falls. Nakata said he arrived at Minidoka during the night, but immediately spotted the barbed wire fencing, guard towers and hundreds of crude barracks which seemed to go on and on. At its largest, the camp housed nearly 10,000 detainees and was one of 10 concentration camps around the West Coast. Eight-year old Nakata, his older sister and his parents received the smallest unit in Block 34, Barrack 6A, which contained four army cots and a potbelly stove. The hastily constructed tar paper barracks couldn’t protect them from the relentless dust storms which left behind a thick layer of ashy soil. Living at camp eventually deteriorated the family unit. Matsumoto said she ran freely around the barracks with her classmates and no longer shared meals with her family. Her mother worked in the mess hall and ate with the other mothers, while her father whittled wood and dined with the men. Even with life so different, she never heard anyone complain. Matsushima’s mother still didn’t know when she would see her husband again. Initially, she knew he had been sent to a Department of Justice camp in Missoula, Mont. When he wrote letters to the family, all information about his imprisonment was redacted. By the end of the war, Matsushima’s father had been moved six times. A year and a half later, the family agreed to return to Japan as part of a prisoner exchange program, but when they showed up at Ellis Island, their names weren’t on the manifest and Matsushima’s father never arrived. Instead, Matsushima, his mother and brother were sent to a high-security Department of Justice camp in Crystal City, Texas, until 1946, a year after the war ended. About 1,000 prisoners at Minidoka were allowed out of the camp when they volunteered for the U.S. Army. The irony was not lost on them. Nakata remembered the gold stars hanging around the barracks. Nakata said the legendary all-Japanese-American 442nd Regimental Combat Team went on to become the most decorated unit for its size and length of service in the history of American warfare. The unit also suffered one of the military’s highest numbers of casualties. Once the camps were closed in the mid-1940s, detainees were given $25 and a train ticket home, but many families from Northwest Portland’s Japantown had nowhere to go. Japantown was gone. Chinese immigrants and other families had moved in while the Japanese were imprisoned. Nakata said it was too painful for his parents to revisit the hotel they once operated, but he wanted to see it. Nakata’s father worked up to 11 hours each day mashing potatoes at a downtown restaurant. Eventually, his father returned to hotel management at the Park Hotel on Northwest Glisan Street and began restoring dilapidated homes for resale. As for Nakata, he graduated from Lewis and Clark College and served in the U.S. Army in Germany, where he had top secret security clearance at Seventh Army Headquarters. He became a successful international businessman helping Japanese companies with trade and investments. After the war, Matsushima’s family borrowed $500 from a friend to reopen their store. “It felt empty like a ghost town when we first came back,” said Matsushima. While Teikoku had been located where a Starbucks now sits on the corner of Northwest Third Avenue and Davis Street, Anzen was located across the street, in the storefront now occupied by Street Roots. Before the war, it had been a Japanese laundry. The store was in the front of the building; the family’s apartment in the back. The grocery store and gift shop remained in business for 109 years after it first opened, eventually moving across the river. The family closed the doors for good in 2014. Matsumoto’s family took over operations at St. George’s Hotel on Southwest First Avenue and Columbia Street after they were freed. After graduating high school, Matsumoto worked in the state welfare office and Oregon Health Sciences University as a medical research assistant. As a board member at the Oregon Nikkei Endowment, Matsumoto helped lay the groundwork for the Japanese-American Historical Plaza – which was dedicated along the Portland waterfront in 1990. The memorial is composed of large scattered stones with etchings of poems and descriptions of what the Japanese immigrants and their families endured before and during World War II. A large plaque explains why it is important to remember the story of Japanese-Americans. “It is in some ways a common American story of an immigrant people, one shared by Americans of many national origins. “It is also a unique story of a people whose Constitutional rights were tragically ignored,” the plaque states.